There’s no better time to simplify and declutter than when you’re about to move. Go through your belongings (especially clothes, books, and kitchen items) and determine which you can donate to a good cause. A good rule of thumb is, if you haven’t worn/used it in the past year, you’re probably not going to. 2. Pack the kitchen first. Old pros will tell you to tackle the worst job first: your kitchen. This room has by far more “stuff” than any other, and saving it for last might just put you over the edge. 3. Pack a “last in, first out” box. This box should be for essentials you’ll need in your new place, like tools, toilet paper, pets’ bowls, light bulbs, alarm clock, box cutter, hand wipes, water bottles, cell phone charger, etc. Make sure this box is the last to go in the truck so it’ll be the first that comes out. 4. Stuff cords in paper towel cores. If you don’t want to find a spaghetti-like mess of cords when you arrive at your destination, start saving the cardboard cores of paper toweling rolls and slip your cords into them. Label each with the name of the equipment it belongs to. 5. Get creative with your wrapping. You’ll certainly need some packing tissue or newspaper, but supplement with items you’ll be moving anyway: towels, blankets, sheets, clothing and socks make great wraps for china, electronics, glassware and other fragile items. When packing plates, place a few paper plates or a single foam plate between each to keep them from breaking in transit. 6. Use wastepaper baskets, laundry baskets, hampers and other storage items to move belongings. For example, luggage with wheels is great for heavy things like books. 7. Utilize zippered storage bags. When taking apart furniture prior to putting it on the truck, place the nuts and bolts in a zippered storage bag and tape it to the item so you don’t lose them. 8. Bundle your clothes on hangers. The best way to pack clothes on hangers is to gather 15 or 20 items together while still on the rod; slip a large garbage bag over the group (pull it up from the bottom) and tie at the top. Then simply slip the whole thing off the rod and load it on the truck! 9. Take pictures of how your TV and other electronics are wired. This makes it easier later so you can easily rewire them accurately once you unpack them. 10. Label boxes on all sides with the name of room first, then its contents. This will keep boxes from being put in the wrong room – and keep you from searching all over your new home for what you need. 11. Don’t start unpacking until all the boxes are in. You’re going to be tempted to start unpacking, but don’t do it – it will just make the process more chaotic and your rooms more difficult to get around in. What kind of help can you provide our future residents? 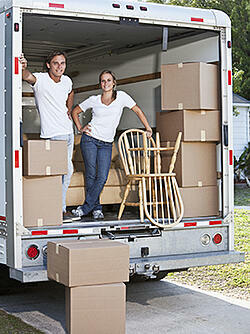 Share your moving day ideas and tricks and we’ll share in a future post.